Meet Claude - no ordinary dog! "Claude in the City is a funny and exciting story written by Alex T. Smith." On a trip to the museum Claude becomes a hero when he visits a museum, foils a robbery, and saves the day! This week we looked at the front cover of the book and made predictions about the characters, plot, problems etc. Who do we think this is? Where is the character going? Why? If the character was speaking what might he say? After making some predictions we read the first few pages of the story. Were we right? Were we wrong? What else do we know now? 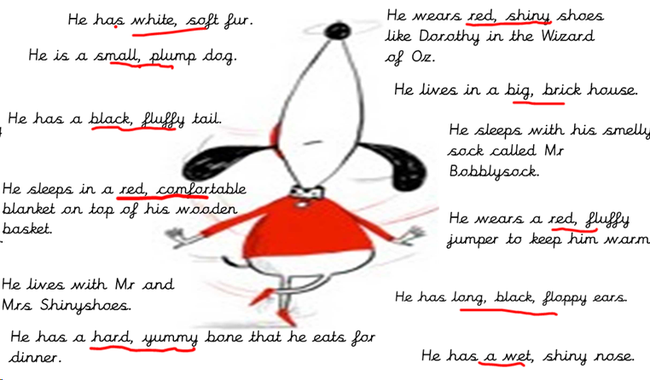 We spoke about what we found out about the character and tried to use expanded noun phrases to describe the main character. Miss Boyle's group had some great ideas.